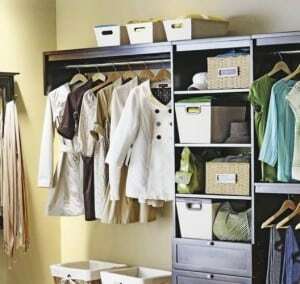 There are oodles of websites and how-to guides that give advice on organising your wardrobe. For a fee you can also pay a professional to come to your home and help you make sense of the muddle, but what skint girl’s got the cash for that? The good news is that organising your stuff is only as complicated as you want it to be. I find the major clothes groups the easiest to deal with. I mean, big clothes just hang in the wardrobe till you fetch them, don’t they? The tricky stuff is the small fry: earrings, necklaces, gloves and scarves, you know, all those things that slip down the back of the dressing table or under the bed – the things you end up buying more of than you need because you’ve mislaid one glove or your favourite pair of earrings. Here’s how to handle them. With an accessories obsession to rival Carrie’s, my jewellery boxes used to be a constant mess. Despite my best efforts my necklaces would invariably tangle around each other, while earrings would all end up in one big jumble that meant I could never find a matching pair in a rush. Then I discovered ice-cube trays. Uh-huh, I know it sounds boring, I know it sounds Martha Stewart, but don’t mock them till you’ve tried them! Now, instead of throwing my earrings all in together I put each pair in their own separate cube. I’ve got a couple of trays for earrings and brooches, another for necklaces and, for larger necklaces that don’t fit in standard ice-cube trays, I use baby weaning trays that you can buy at many chemists. These are designed for freezing individual portions of food for weaning babies and are just like ice-cube trays but bigger and deeper, so they fit chunky necklaces and larger brooches. Now I can find things at a glance and because everything’s on display it means I wear all my jewellery more frequently, instead of just relying on the one necklace that isn’t tangled. Baby, my jewellery has never been so neat. For bulky necklaces and bracelets that don’t fit in ice-cube trays, try a mug tree, with ribbon twisted round the metal or wooden arms. It’s cheaper and much more effective than those expensive jewellery stands, which never have enough arms. I’ve been collecting scarves since my early teens and use them to brighten up my look in all sorts of ways. Knotted at the side of the neck for a touch of Parisian style, tied under the collar of a black coat to add a splash of colour, or knotted through the belt loops of my jeans on a Saturday morning, scarves transform an outfit. But with so many it’s just not practical to keep them in a drawer: I can never find the one I want that way, so these days I knot one end round the base of a coat hanger – the sort designed to hold folded trousers – and leave the rest of the scarf dangling below. Two or three coat hangers house my full scarf collection and I scale them in colour so they’re easy to find. Simple. Men’s tie racks are the best way to store these: just loop the belt through a slot, same as you would with a tie. The best thing about tie racks is that they’re ten a penny in almost every charity shop in the land. Hang these on hooks inside a cupboard. It needn’t even be in the bedroom if you’re short of space. What about the nook where you store your ironing board and hoover? Could you put up some nice big hooks at random heights and store your bag collection there? Handbags can also be stored in ottomans or blanket boxes at the foot of your bed: keep your eyes peeled at charity shops, auctions and car boot sales. Though it may take up more space, shoes behave best when kept in their original boxes, otherwise pairs inevitably get separated and you spend fifteen minutes pulling everything out of the bottom of your wardrobe each morning to find the missing one. They get dirtier kicking around on the wardrobe floor too. Write what’s inside on the box to make them easy to find. No need to stick a Polaroid photo on the front – what’s all that about? You know what your own shoes look like. Like handbags, shoes don’t need to live in the wardrobe – they’re as happy lined up under the bed or in the hall cupboard. By keeping the small stuff organised we can save money and feel more in control – of our accessories at least . . . if only the rest of life were so simple! Skint in the City writes about living the stylish life on a shoestring budget, such as how to buy Pucci and decorate apartments even when you’re living on a starter’s salary. Mixing down-to-earth personal finance with tips on budget style, entertaining and home styling, Skint in the City is for those who haven’t given up on their dreams of living the stylish life – even if their budget’s currently tighter than their skinny jeans.